Is The Diadora Fit Bike Racer 23 Exercise Bike To Small And Flashy To Be Of Worth? 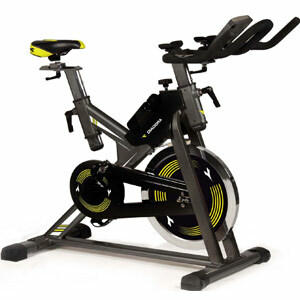 The Diadora Fit Bike Racer 23 Exercise Bike is an interesting option for anyone that is into training and spinning and doesn’t want the typical, basic exercise machine at home. The shape and design of the bike shows that this is something a bit different and even though it is quite small and compact, it should pack quite a punch. It has a 23kg flywheel, which should be heavy enough for most needs, and an LCD console for all the data. Is this the ideal option for home spinners or is there a clear flaw to watch out for?